"back when I was graduating from high school I remember the "great global cooling." Is this "great global cooling" similar to the great global warming that is going on today?" "I couldn't help but pull up the Time magazine front page article dated April 28th, 1975 where we have a penguin on the cover and it says "How to Survive the Coming Ice Age". How do you compare that global cooling claim versus today's global warming claim?" "In this sense yes [1970s cooling predictions were similar to current warming predictions], our ignorance about the climate system is just enormous"
Let's examine the many reasons why the 1970s cooling predictions were different than today's warming predictions, which an honest scientist would have discussed. As Dr. Kerry Emanuel noted after Dr. Christy's second affirmation of this myth, only a few scientific papers in the 1970s predicted global cooling, and were subsequently amplified by the mainstream media, as noted in Congressman Brooks' question. In fact, the majority of climate science studies at the time predicted global warming (Figure 1). Conversely, there is currently a scientific consensus that the planet will continue to warm. Dozens of major scientific bodies throughout the world have affirmed the consensus, while no major scientific bodies predicted global cooling in the 1970s. Although it's certainly true that we don't understand all of the detailed workings of the global climate and still have much to learn, climate scientists have made great strides understanding what drives climate change over the past 40 years. In the 1970s, there were no climate satellites and no Antarctic ice cores. Climate modeling was in its infancy; today's extremely sophisticated climate models are run on supercomputers. Over the intervening decades there has been an immense amount of climate-related data collected, and many thousands of climate studies published. We have learned a great deal about the various warming and cooling effects on the climate, including greenhouse gases and aerosols. Dr. Christy's insinuation that we remain nearly as ignorant about the workings of the climate today as the 1970s is simply ludicrous, and an insult to his climate scientist colleagues. He's effectively pushing the logical fallacy that "we don't know everything, therefore we know nothing." "An increase by only a factor of 4 in global aerosol background concentration may be sufficient to reduce the surface temperature by as much as 3.5°K." 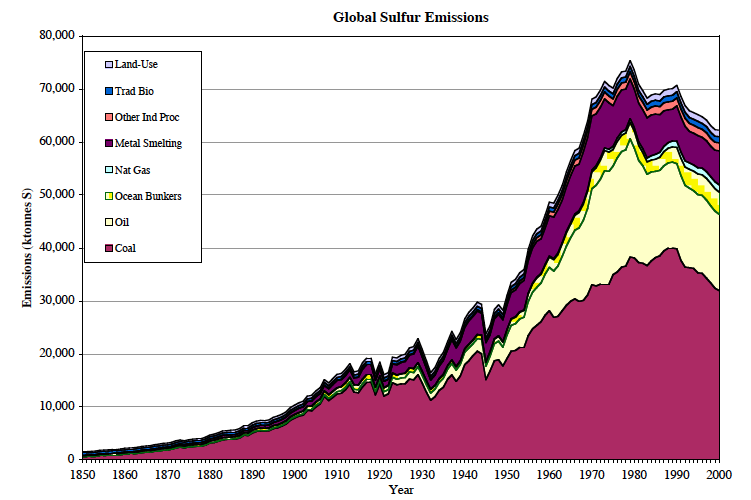 The real similarity is that if we now limit CO2 emissions, we can also eventually get global warming under control. Dr. Christy chose not to mention any of these major differences, or the similarity in the solutions to the problems posed by SO2 and CO2. Instead he chose to pretend that the two examples are similar, leading our Republican policymakers to their desired conclusion: that because there was a supposed consensus predicting global cooling in the 1970s which didn't come to fruition, that there's no reason to believe that today's consensus of continued global warming will come to fruition. This delusion of pretending that an environmental problem we solved was never a problem at all (e.g. ozone depletion, acid rain, etc.) seems to be a common strategy among "skeptics." The reason these cooling predictions didn't come to fruition, aside from the continued acceleration of CO2 emissions, is that we put limits on SO2 emissions to solve the problem. It's not that it was never a concern or it went away on it's own; we did something about it. The same applies to global warming and CO2. It's a problem and it's not going away unless we do something about it. Christy's intellectual dishonesty while testifying before Congress under oath has misinformed our policymakers. Once again, Christy has done his country a disservice through his Congressional testimony. NOTE: This post has been incorporated into the Intermediate rebuttal to "Ice Age predicted in the '70s"